The 5637 Steam Locomotive Group is responsible for the preservation, restoration, operation and maintenance of Great Western Railway tank engine 5637. The 5637 SLG is a non-profit making organisation and all funds are used exclusively for locomotive 5637. The GWR Steam Loco Fund was originally set up by a number of Swindon & Cricklade Railway members to raise funds to purchase a Swindon built GWR locomotive. No 5637 was obtained and eventually purchased and at that point the Fund was reconstituted as the 5637 Steam Loco Group. The members of the 5637 SLG are shareholders of the locomotive which is collectively owned by them. Shareholders receive regular newsletters and are entitled to attend the annual Shareholders’ Day held at the host railway. See join us for information about how to become a 5637 shareholder. General Meetings are held from time to time, often during the annual Shareholder’s Day. The 5637 SLG is constituted so that each shareholder has one vote regardless of the number of shares they own. An elected Management Committee is responsible for the day to day activities of the 5637 SLG, though in practice its members are usually nominated by shareholders. The Management Committee consists of a Chairman, Treasurer and Secretary with other shareholders providing help and advice. The major activity undertaken by the 5637 SLG was the complete restoration of 5637. 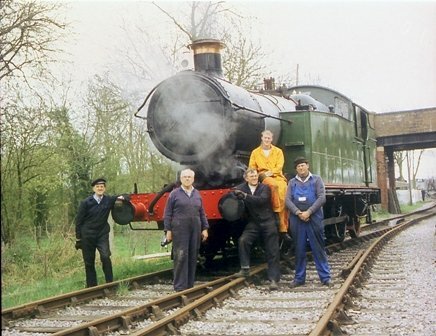 This involved intensive reconstruction work and fund raising over a 17 year period to get the locomotive steaming again. See restoration for a detailed account of how the work was carried out. The 5637 SLG’s main concern now is to ensure the continuing operation of the locomotive into the future. In particular the SLG arranges for 5637 to be used on suitable heritage railways and agrees the terms of the hire contracts, both long term and short term. The steaming fees paid by hiring railways are the SLG’s main source of income and supplemented by other fund raising activities are vital to maintain the 5637 in working condition. Clearly a steam locomotive built in 1925 is very expensive to keep running as apart from the day to day maintenance there is an ongoing need for repairs and replacement of failed parts. Added to this is the need to completely overhaul the locomotive’s boiler every 10 years to ensure it is safe to operate which is prohibitively expensive. 5637 completed its first major overhaul since restoration in June 2010 and hopefully will remain in service for another ten years. Details of the work carried out can be found in the overhaul section.